There is no doubt about the fact that the current trend for Cydia tweaks is all about modifying the new Notification Center and giving additional functionality to the Siri digital assistant software. Since the release of iOS 5 in October of last year, the Cydia store has been inundated with modifications and tweaks which add widgets, settings and even an animated Nyan cat to the Notification Center screen, but in all honesty there are only a handful which are any good. One of the better widgets for the Notification Center has to be the very useful WeeTrackData tool which allows jailbroken users to keep track of all cellular data usage. The iPhone is an extremely data hungry device which consumes packets of data like no other, even when you aren’t actively downloading things the chances are a number of your applications are sniffing data or the mail app is set to push and is seeking out new mail every few minutes. All of this data usage quickly adds up and with certain network providers capping data usage and charging extortionate amounts for out of bundle usage it becomes quite important to stay on top of your usage. The developer of WeeTrackData is a certain Albert Schulz, who as you may know already has Cydia proven pedigree with his YouTubeToMP3 tweaks. Schulz also has existing Notification Center tweaks, namely WeeRadio for Notification Center and WeeCompose which always puts me at ease when a developer has a history and the experience of producing a certain type of tool. After installing the WeeTrackData tool, it immediately becomes evident that the developer has thought about the best way to implement this functionality whilst retaining the simplicity that a Notification Center widget should have. A standalone settings entry is created for the widget which allows the user to set their monthly data allowance as well as the day of the month that they receive their new allowance which lets the widget work out monthly, daily and weekly usage percentages. WeeTrackData is added to Notification Center through the official means of accessing ‘Notifications’ through the settings application, and the toggling the Notification Center switch to ‘On’. The set up of this tweak is literally as simple as that and by invoking the NC you will now see the tweak present and initially showing the monthly usage stats. By using swipe gestures, the user can switch between monthly and weekly statistics as well as the current day’s data usage. The widget also shows the uploaded and downloaded data as well a small information bar which allows quick access to the settings panel as well as the developer’s website and Twitter accounts. Through my conversations with the developer, it is also exciting to know that he is working on an iPad compatible version of this widget as well. WeeTrackData is a fantastically useful and professional commercial tweak which more than justifies the one time $1.99 layout considering it could potentially save users from exceeding their limited data plan which is then billed at astronomical network rates. 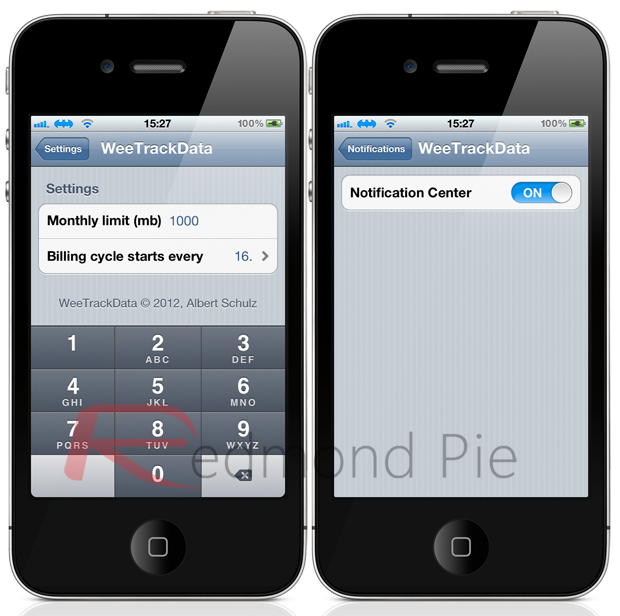 WeeTrackData is available from the Big Boss repository in Cydia at a cost of $1.99.